Supreme Sports is on a mission to make the game of basketball more accessible to residents throughout Chicago, IL and have expanded our court installation options to rooftops. The Windy City is home to many brownstones and other types of row housing that have accessible rooftops that are going unused. Many of these homeowners are converting their roof spaces into outdoor gardens and practice sports areas. Our perimeter fencing help keep the game safer during all times of the day and allow it to last long into the evening hours. Our fencing options come in heights up to 12 feet for added safety. When combined with the rebounder systems, the bungee cord mesh can help keep the ball within the court instead of someone else's backyard. These are just some of the safety options we provide for basketball court installations done throughout Chicago. What makes Supreme Sports truly different is our surfaces. We install innovative sports tile that absorbs impact, protecting the joints and reducing muscle fatigue. It also doubles as a sound barrier to those below the rooftop. The tile provides great foot traction, allowing for better game performance, and the porous interlocking pieces keeps the court dry and free from standing water. Clean-up is a breeze too. Simply sweep the surface or use a garden hose to rinse away any debris. 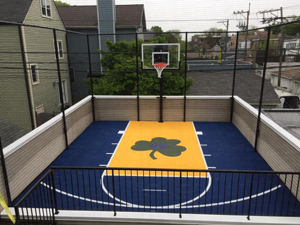 Elevate your basketball game by asking Supreme Sports of Chicago about our rooftop court installation options. Our experts know what athletes need from their sports surfaces and have installed indoor and outdoor courts throughout Cook County, Kane County, and Dupage County in Illinois. Schedule your free design consultation with us today!